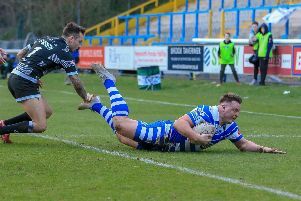 Halifax coach Richard Marshall insisted hard work is the only solution to his side’s current predicament after they were unceremoniously flogged 48-12 by Championship title favourites Toronto at the Shay. 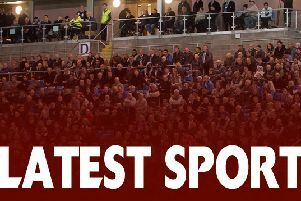 Fas went into the game looking to atone for last weekend’s sub-par showing at York, but ended up with more unanswered questions as the Wolfpack’s mix of NRL and Super League stars ruthlessly exposed their current defensive issues. “It wasn’t the performance we wanted and spoke about during the week,” said Marshall. “We weren’t great at York and we wanted to build this week; it was about performing better and I don’t think we managed to do that. “I was happy with the first 15 minutes or so, we put the plan into action, got some points on the board and put them under some pressure. “But they rolled us from one end of the field to the other, put a couple of tries on and we ended up getting taught a lesson. “The pace they play at, and Jon Wilkin playing smart, straight and right at the line, makes it difficult and they stripped us for numbers on numerous occasions. “Defensively, we are way off from the levels we have been at and the levels we should be at. “That needs to improve and improve really, really quickly. “You can talk about what we do with the ball and game plans, but it’s irrelevant when you’re conceding points like we are. “Some of it is down to the lack of ball; we can’t complete four sets in a row at the start of games and at the start of halves. “Most amateur teams could probably do that, get those four sets done, and we can’t at the moment. “We’re not as good as we think we are technically at the ruck and there’s attitude there too; do we want to do those extra efforts? “We’ve done that so many times and we want to get that back. “That comes from the training field and the work you do during the week. “I think we’ve improved the team, so I don’t think it’s the personnel. “There are no excuses, but it’s tough; for me as a coach and the players. “Turning it round comes from hard work and we’ve done that before, so we’ve got some experience of that. “It’s not about words though, it’s about actions and following things through. Marshall recalled Samoan full back Quentin Laulu-Togagae, with half back Ben Johnston and Simon Grix also returning from injury. “They weren’t fit, but they both wanted to play and help their teammates out,” said Marshall. “Simon wasn’t right but he did everything he could, Johnston wasn’t right; you could see the strapping on his leg.